4C Foods Corp. is voluntarily recalling its 6-oz. 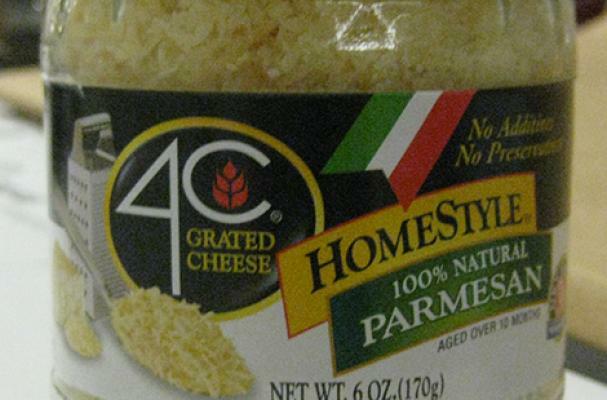 glass jars of "4C Grated Cheese HomeStyle Parmesan", UPC 0-41387-32790-8 with code dates BEST BY JUL 21 2016 and JUL 22 2016 due to possible contamination with Salmonella. This recall does not impact any other 4C cheese products. 308 cases were affected, and the risk was found during an FDA routing testing. The product was distributed to retail stores in the following states: IA, IL, MI, MN, ND, NE, SD, and WI. Packed in 12 jar cases, the best by dates can be found on the back side of the jar, toward the bottom. If you have purchased this item, do not return it to the store where it was purchased. Consumers are urged to dispose of the product and its container. FMI: 4C Foods at 1-718-272-7800 ext. 176, Monday – Friday, 9:30 AM to 4:30 PM (Eastern Time), for a replacement or full refund and for general inquires.